For most of us flexibility can feel like an unrealistic reality. However it doesn’t have to be… The good news is, anyone can become flexible, it just takes patience, consistency and knowledge of safe stretching. Just Stretch is a deep trigger point targeted release stretch class. The benefits of Just Stretch are both instantaneous and long term, for your body, mind and soul. I can tell you from experience, once you start to take regular morning or evening stretches you will be asking yourself why you haven’t started sooner. 70% of us work from a desk, so by taking the time to lengthen your muscles you are re-setting your posture and body to avoid permanent imbalances. It is important to stretch out the postural muscles to avoid hunched shoulders, back problems, tight hamstrings and weak glutes after a long day at your desk. These issues might seem insignificant now, but they can catch up with you and have a long term impact. Stretching in the first few hours of waking has shown to improve longer lasting flexibility that doesn’t leave you exhausted to complete the rest of your day. Stretching creates muscle memory, leading to sustainable flexibility. Morning stiffness is common. This is because the joints and spinal discs increase in our sleep, creating joint discomfort and stiffness in the morning. Most of the time the first thing we do when getting out of bed is stretch our arms over head trying to lengthen and release our spines. Animals instinctively do this too. Ever wondered why? Muscles tightness can either be from exercise the day before, or from your body’s sleeping position, stretching can help prevent this. It also helps avoid common injuries. If your muscles are warm, stretched, and active it is less likely you will tear/pull a muscle or get cramps throughout the day. As mentioned earlier stretching is a workout in itself, as it raises the heart rate, body awareness, balance and control. Gentle stretching helps raise your body’s temperature by getting the blood flowing increasing circulation and the delivery of oxygen and nutrients to all of your muscles and organs. With increased blood flow throughout the body, your brain also benefits. This improves concentration and allows you to focus on your day ahead. It also accelerates endorphins to the brain helping relieve stress and anxiety. Stretching can also help release mental tension and improve mental wellness. Do quick stretches after an exercise count as stretching? The difference between a 5-15second stretch and 30-45 second stretch is huge. Quick, ‘maintenance stretches’ after exercise are simply to release the muscle being worked and encourage it to return back to its normal length. For example in a series of squats your glute muscles will be contracting and shortening. Stretching the glutes straight after the squats is necessary to bring the muscle back to its resting length. Which is great, and beneficial. However if you are looking to improve flexibility and not just a quick release to avoid DOMS, the muscles need to be stretched and lengthened beyond the resting length, held for a minimum of 30 seconds and repeated 2-3 times. Over time the muscle memory will kick in and the muscle will remain longer. Frog: Lying on your stomach with your forearms on the floor and elbows underneath your shoulders, knees bent out to the side at 90-degree angles in line with your hips and your feet flexed, pressing your hips down towards the floor. This frog position will open out your hips and stretch your inner thighs. 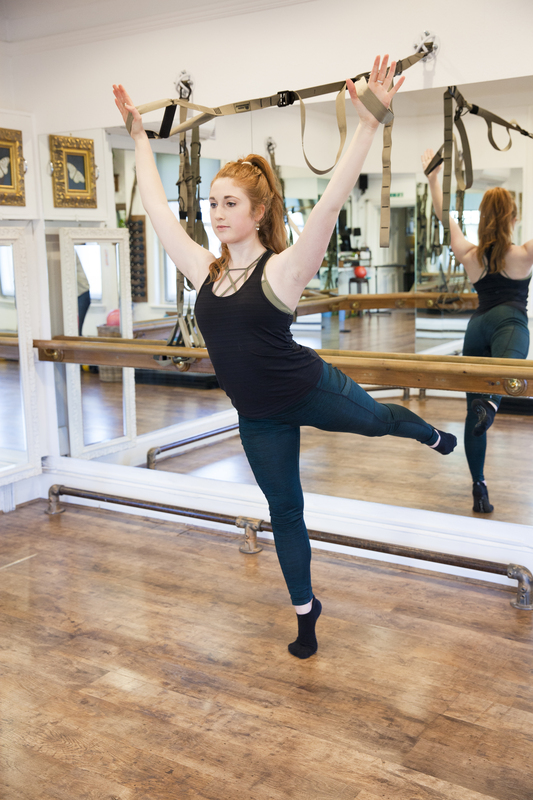 Deep lunge: positioning your legs into a lunge position with the back leg long and knee resting on the floor, hands holding onto a barre in front of you or by either side of your front foot, keeping your stomach scooped in, the hips square and tucking the tailbone under. Hips should remain as low as possible throughout. Take a deep inhale to prepare, on the exhale, tuck your back toes under and into the floor and press your back heel away from you, aiming to straighten your back knee. Without your hips lifting. Hold the knee off the floor for 3 deep breaths. This deep lunge will stretch the front of your hip, your hip flexor, quad, and inside hips, you may also feel a slight stretch into your obliques. Titanic chest opener, standing in parallel, squeezing your glutes, inner thighs and keeping your core switched on. Reach your arms back behind you, with your arms long, holding on to a barre, table top or trx ( or equivalent ). Start to press your chest forwards leaning your body away from the barre. Maintaining relaxed shoulders, and your ribs in. Slowly rotate your head from one side to the other. This Titanic feeling stretch will open your chest, stretching your pecks, front of shoulders, and biceps. This is a great stretch to improve posture.